As a business owner, making sure your equipment is running smoothly and efficiently is of the utmost importance. But, imagine a hot summer day. Customers are flocking to your business to receive an ice-cold drink, only to find out that your ice machine is not working. Customer satisfaction is on the top of your list when it comes to running a successful business. Without the customer’s approval, your business would be next to nothing with little to no sales. We know just how important this factor is, from mom-and-pop shops to big corporations. 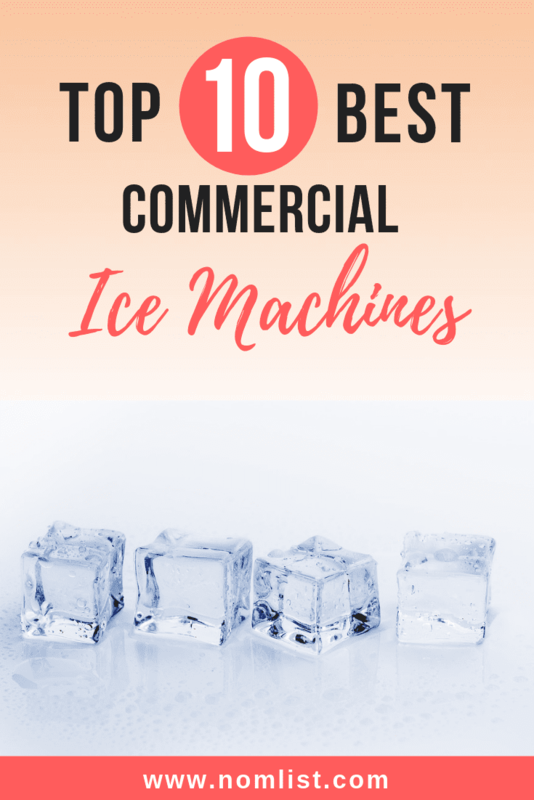 That is why we took special care in selecting only premiere products for this list of the top ten best commercial ice machines. Of course, you’ll want to consider different variables when selecting your ice machine, depending on the needs of your business. When scrolling through the list, take note of how much space you will need, storage size of the bin needed, how much ice you want to produce, whether you need an under counter ice machine and how fast you want it produced. Regardless of your needs in an individual machine, investing in a commercial ice machine is good for business if lots of ice is what you need! If you are looking for the most versatile commercial ice maker on the market this year and one of the best commercial ice makers on the market in general, look no further than the Costzon. When it comes to commercial ice makers, the Costzon is more in the medium-size range. This handy ice maker has 200 watts of power and is free standing. It has the capability to create 110 pounds of ice cubes within 24 hours. The extra storage area has a capacity of 33 pounds. It is made of stainless steel, making it rust resistant. The ice cycle takes about 12 to 18 minutes to complete. We love this ice maker because it is completely automatic, works like a charm, and makes bullet shaped ice. Installation of this ice maker can virtually happen anywhere there is access to a water supply and drainage area. Although a bit smaller than the previous model, the Costway is an exceptional design for a professional grade ice maker and that makes it one of the best commercial ice makers. It features a sleek stainless steel finish with a curved panel in the front and curved door. For extra durability, the Costway is also designed with ABS plastic that is odorless and colorless. The operating system has an LED display. When you own a business, cleanliness of your operating equipment is important. We love that this product features an antibacterial liner to prevent the breeding of bacteria and the production of sanitary ice. The Costway allows you to make up to 58 pounds of ice automatically, daily. This free-standing ice maker is another one by Costzon. This design is made of PP and stainless steel, meaning that it is extremely rust resistant. The Costzon creates 28 cubes in each fifteen minute cycle. It has the ice making power of 460 watts. What we love about this product is that you can adjust the thickness of your ice cubes. You can plug this machine in and let it run, without the worry of it overflowing. The reason for this, is when the ice reaches a certain height the machine goes into automatic shutdown mode. When a certain amount of ice is then removed, the machine will start creating new ice again. So, you don’t ever have to worry about turning this product off and on. This machine also comes with a sanitary antibacterial liner so you don’t have to worry about dirty ice in your machine. The Ensue is a little more heavier duty than the previous models listed. The Ensue was specifically designed for creating ice cubes in bulk. This means the Ensue is one of the best commercial ice makers for the perfect selection for a business owner that is tending to a larger customer base. This would mean bars, restaurants, and grocery stores with a lot of foot traffic. It has a 200 watt ice making power capability and can make up to 100 pounds of ice in a day. The holding area can fit up to 30 pounds of ice. It features a lighted LED front display, so you know all the controls and functions are working properly. If you are looking for the leading brand of the best commercial ice machines used by franchises all over the United States, you would want to look into investing in the Manitowoc brand. These highly sought after ice makers are hard to come by. It has a stainless steel finish that makes it rust resistant. As you can see, this product is much larger than our previous models. They feature state of the art holding cells that keep your ice cold, even after production. This means these products are one of the top leaders in energy efficiency. The Manitowoc Neo can produce a whopping 304 pounds of ice in a 24 hour period. It can store up to 100 pounds of ice at a time. The Neo is designed for a larger scale business that goes not only through ice quickly, but a lot of it at once. The Vevor makes our list of the best commercial ice machines because it is high efficiency. The Vevor has the ability to adjust the thickness of the ice cubes it makes. If you are wanting thin ice, it will take up to 8 minutes. If you want a medium thickness, it will take up to 11 minutes. Thick ice takes up to 15 minutes. The power of the Vevor is 230 watts. It has the capability to be free standing or built-in. The Vevor ice maker has an intelligent board and sensor that allows you to view a control pad. This monitors temperature and makes sure there is always fresh ice cubes. Even if there is power failure, the ice will stay cooled for up to seven hours. The EdgeStar is a bit more of a smaller version than our larger models we listed. But, it would be perfect for a restaurant or a full-service bar. There is a vent latched onto the front, so this product can be built-in or freestanding. A partial water line connection is included, which is very convenient. The little, but mighty EdgeStar can produce up to 12 pounds of ice per day. It can store up to half that amount in it’s storage cell that is designed to keep the ice cool. That’s right, the unit operates as a freezer, so no drainage line is required. This is why we added this product to our list of the best commercial ice machines. It is the first one listed that does not require a drainage line. This EdgeStar is a much larger version than the one we just discussed. This EdgeStar version can hold up to 25 pounds of ice. However, this model does not allow the ice to stay frozen. But, it is well insulated. For this reason, a drain pump is conveniently included. This may seem like a burden, but keep in mind that larger scale ice machines need a drain pump and can’t freeze in order to function properly. The door is reversible, providing easy access. We love that the bottom of this machine has adjustable leveling legs, so you can pick the perfect height for wherever you need this product. The installation for this product, believe it or not, is simple as one-two-three. It is only a simple 3-step installation. It produces amazing quality clear cubed ice cubes. This EdgeStar is a much larger version than the one we just discussed. This EdgeStar version can hold up to 25 pounds of ice. However, this model does not allow the ice to stay frozen. But, it is well insulated. For this reason, a drain pump is conveniently included. This may seem like a burden, but keep in mind that larger scale ice machines need a drain pump and can’t freeze in order to function properly. The door is reversible, providing easy access. We love that the bottom of this machine has adjustable leveling legs, so you can pick the perfect height for wherever you need this product. The installation for this product, believe it or not, is simple as one-two-three. It is only a simple 3-step installation. It produces amazing quality clear cubed ice cubes. Never worry about ice again with the full-sized EdgeStar. This 65 pound capacity commercial ice machine is built with stainless steel and features a black door. It conveniently hosts a built-in compressor protection system. The storage bin holds 24 pounds of ice. It has an easy to read and monitor LED control pad. The LED operating pad will light up different colors to convey different processes at work or if there is an error with the product. When the storage bin is full, ice production stops. This prevents an overflow of ice and allows you to not have to monitor the machine. Once ice is removed, the product will resume making ice. This product is extremely versatile. It can be used in a variety of different businesses, as well as a home setting. The little Luma is sweeping the internet right now. We have seen this product in several cafes already, due to it’s production of clear restaurant quality ice. It’s compact design makes it the perfect commercial ice machine for smaller restaurants or locations that have a smaller or cramped kitchen area. The Luma can produce up to 28 pounds of ice a day, which is pretty impressive for it’s size. This ice machine requires no installation, simpl plug it in and add water. Ice is able to be created every 15 minutes. With Luma, the ice is never cloudy and it’s sleek design makes it look great anywhere. It features a button control pad that is easy to use. There are some factors you will want to consider when deciding on an ice machine. Where will you put it? Will there be enough room in the storage bin? How much ice do you need to produce per day? These different factors can be detrimental to your business and they can also vary. That is why we included some variety on this list of the best commercial ice machines. Having quality equipment that runs smoothly, leads to business that runs smoothly. All the ice machines listed above are guaranteed, literally, to give you crystal clear ice in a matter of minutes. If you’re making drinks and it’s a hot day or you’ve just hit a huge lunch rush, you wouldn’t want to be running out ice. Not only is it bad for business, but it can hurt your customer base as well. You wouldn’t want to be caught without ice during a crucial time like that, especially if you are known for serving ice cold drinks. Having a properly working commercial ice machine is essential for every business owner who uses ice in their day to day operations. This is why a commercial ice machine is a very important investment that should not be overlooked. Previous articleThe Top 6 Best Long Slot Toasters for all your Artisan Bread needs!